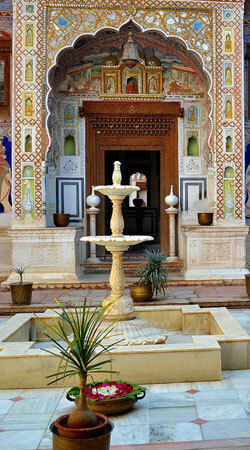 A huge state in India's north-west, Rajasthan has a long and colourful history and a vibrant modern culture. Vast deserts which stretch to the horizon, glorious forts and palaces - many still occupied by the descendants of their founders-, brightly turbaned camel herders- these are iconic images of this fascinating state. Street musicians, artisans and traders flock to the busy cities of Jaipur, Udaipur, Jodhpur, while out in the countryside, the hot desert sun ensures that life is never conducted at too hectic a pace. The 15th century Jain temple at Ranakpur is visited either on a day trip from Udaipur or enroute from Udaipur to Jodhpur. 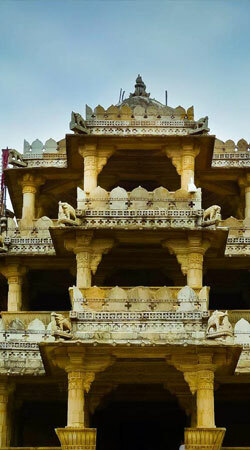 It is the largest and most complex Jain temple in India. There are a staggering 1444 carved columns that create areas of changing light, a most unusual sense of space and serenity. 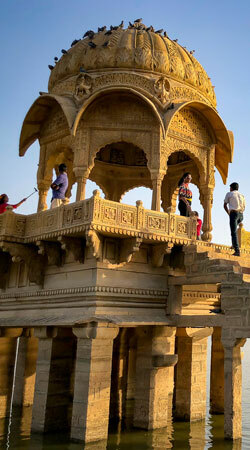 The Shekawathi region is home to a number of small settlements including Mandawa and Jhunjunu. Here you can walk around the painted Haweli's taking in the varied subject matter used in the frescoes. Some have been restored and others are in original condition. 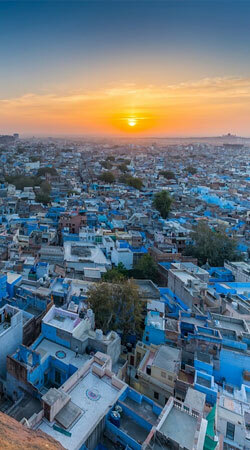 Known as the "Blue City" for the characteristic plea indigo colour of its traditional homes, a day in Jodhpur can include a visit to the majestic Mehrangarh Fort, built atop a 400 ft. promontory. Below the fort, visit the Jaswant Thada, a graceful marble cenotaph built 1899 for Maharaja Jaswant Singh II, and monuments to other Maharajahs of Jodhpur. A half day jeep trip out into the Bishnoi villages gives an insight into the lifestyle of this conservation minded community. They preserve the local wildlife, including the Black Buck. You can also visit small Dhurrie weaving centres where brightly coloured throw rugs are created. Perhaps the most romantic city in Rajasthan, Udaipur is built on the shores of Lake Pichola and dominated by the Lake and City Palaces. This region is famous for the schools of miniature painting done with one or two hair brushes, recreating the scenes of the old Mughal courts, processions and Hindu deities. 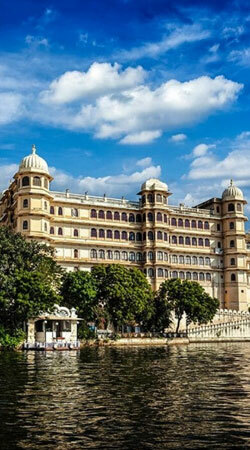 You can view the private collections of the Maharajah within the main Udaipur Palace, take a boat ride on Lake Pichola or enjoy an evening sound and light show at the main palace complex, bringing back the images of the days when the Maharajahs ruled. Located on the western edge of the Thar Desert, Jaisalmer has a special aura, the colours of the sandstone walls of the palace change with the sunset. Here short camel rides are available at the Sam Dunes with the more adventurous taking longer treks with camping arranged in the desert. Beyond the main centres there are the small palaces, temples and Hawelis. 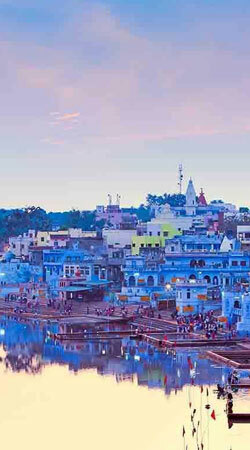 Pushkar is a small town set around the sacred lake and the only temple dedicated to Brahma in India. Its population swells to many thousands during the annual Camel Fair in October / November each year. The isolated forts of Chittorgarh and Kumbalgarh can also be visited enroute to the other major centres or have accommodation for an overnight stop to explore the villages as well as the monuments.